Thermae Abano Montegrotto: well being specialists. 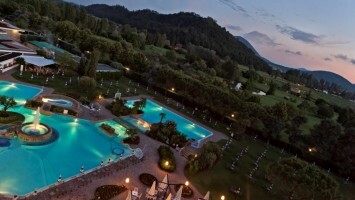 In order to regain perfect physical form and appearance through a health spa vacation, all the spa hotels in the area offer a wide range of restorative and well-being treatments and programmes, in line with the long tradition of wellness of Abano and Montegrotto Terme, Padua. Expert and qualified staff will help you to recover lost energy, beauty and all-round well-being through massage, innovative treatments, a balanced diet and treatments using spa products. To renew the elasticity and freshness of the skin, combat sagging muscles in the face and the rest of the body, and regain psychophysical energy in general every spa hotel has very special offers, tailor made. Each spa hotel offers whirlpools, indoor and outdoor spa pools and a whole department dedicated to well-being and therapies, to ensure that all guests are followed with the utmost attention and professionalism, in a comfortable, pleasant atmosphere.